Newport, Rhode Island in the USA is the home of the homes — majestic mansions on manicured estates with sea views and more bedrooms than a small hotel. Some date back to the late 1800s and several are now museums open to the public. 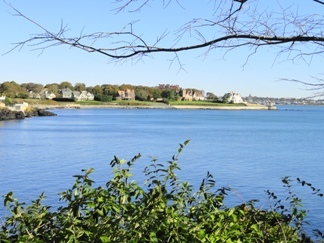 But instead of looking from the mansions out to sea, Newport offers a completely cost-free experience where you can look from the sea back to the mansions. It’s called the Cliff Walk and it’s a must-do if visiting this region. The walk extends from Bailey’s Beach at the end of Bellevue Avenue in the south to Easton’s Beach at Memorial Avenue in the north. This obviously doesn’t mean much to anyone not living in Newport, so a Google map investigation may be necessary. The northern section of the Cliff Walk is easy going and fully paved. Further south the track becomes more rugged without being too difficult and the more natural setting has a charm of its own. The entire walk is about 3.5 miles along the coastline and then you still have to get back to where you parked your car. This adds to the length of the walk unless you jump on one of the local tourist buses. There are several access and exit points along the way, making the choice of the walk’s length more accommodating. I recommend beginning early in the day and hiking from south to north so the hard work is done before it becomes too warm. In wet weather the southern part may become more treacherous and this section also includes the longest stretch of the walk without an exit point. The scenery is breathtaking. On one side is the jagged coastline with rocky outcrops jutting from beneath the waves, and on the other, green lawns and giant houses. There are no real beaches along most of the walk, which probably explains why the local homeowners haven’t made a bigger fuss about the creation and maintenance of the walk in their backyards. Imagine most millionaires accepting a public path between them and their “private” beaches without a fight. 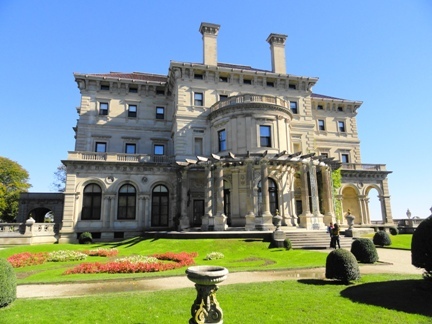 During the walk you will pass by the historic Marble House, Rosecliff and The Breakers as well as more contemporary buildings inhabited by the Newport rich. While in Newport, visiting one or more of the heritage houses is irresistible. Seeing how people lived at the turn of the twentieth century is both enlightening and comforting. It’s fascinating to see the pomp and circumstance of the intricately-designed buildings that housed some of the country’s wealthiest families, yet for all their glamour, a person today really wouldn’t want to reside in these monuments to excess with their lack of the modern conveniences we all take for granted. A five-mansion pass can be p urchased online for $31 on www.newportmansions.org. The Cliff Walk in Newport is deservedly one of the most highly rated walks in the United States. Getting there isn’t too difficult but a car is the best way. 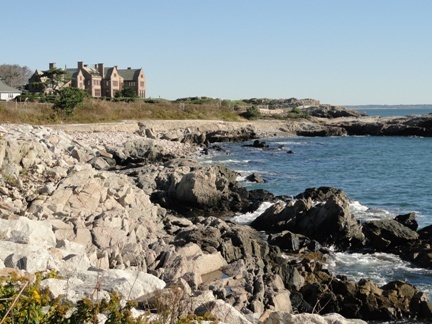 Newport is about an 80-minute drive from Boston and 3½ hours from New York. The bridges coming in from the west are spectacular structures in themselves. Hotels in Newport can be expensive. A more economical option is to look in nearby Middletown. Howard Johnson is recommended, with spacious rooms around $120 per night.